Can we really touch the past? I think so. It can hit you like when you visit a place such as Gettysburg or the cemeteries at Normandy and see the names engraved on the markers. The fallen heroes buried there were so young. They had families. Lives. Who would they have become? What achievements have we been denied for their early sacrifice? How would I have acted if I’d been there? There is a search we have when we go to such place. A pondering over people who will never age, who will forever be 19 or 21, but you can’t help but wonder who they might have been. Too, as the years put distance to their lives, you wonder if anyone thinks about them anymore or, as is really inevitable, time leaves them as faceless names, figures of history we’ll never really know. 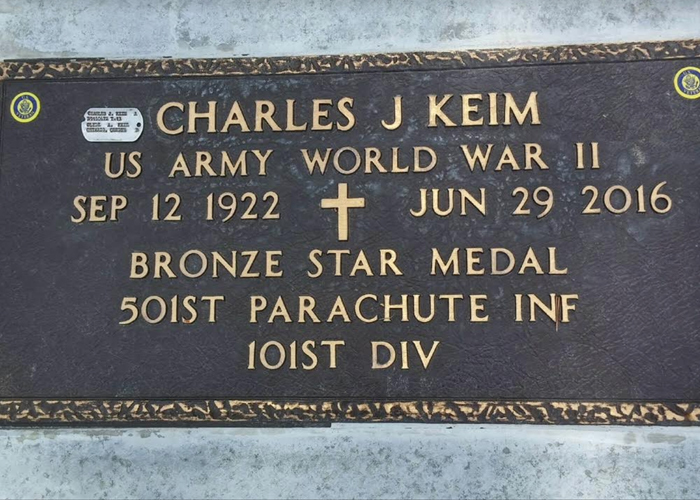 But then there is the rare exception, as in the case of Charles J. Keim of Ontario, Oregon. Charles, “Chick” was his nickname, was born in September of 1922. 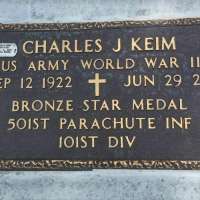 He was Protestant, I know that much, and he died in June of 2016, one of the rapidly shrinking ranks of World War II veterans…aptly named, “The Greatest Generation.” Chick joined the Army after graduating high school in 1942. 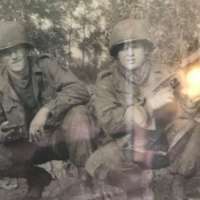 He served as a Private First Class, a paratrooper with the 101st Airborne division, and the records show he was in Normandy, Holland, and the Battle of the Bulge, and was for a while a prisoner of war. On June 5, 1944 at the beginning of the D-Day invasion, the C-47 transport he was on for Normandy was hit and caught fire forcing the paratroopers to drop short of their drop zone. Chick caught a piece of shrapnel in his rear end, which earned him his first decoration, the Purple Heart for his wound. In September 1944, while fighting in Holland during Operation Market Garden he was briefly made a POW, when Germans surrounded his unit when they were trying to recover equipment that had been dropped by parachute. While a prisoner, a German took the knife his father had given him, which in turn was taken from the German by a British Marine and returned to Chick 35 years later. Private Heim carried shrapnel in his leg from the action in Holland until the day he died. 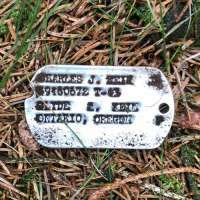 Chick “lived in snow for 52 days” he would say, with his fellow combatants (Company H, 501st Parachute Infantry Regiment, 101st Airborne) during the bloody Battle of the Bulge, where he somehow lost one of his dog tags in the forest near his foxhole north of the town of Foy, Belgium. Near the very end of the war Chick was with the 101st Airborne when they captured Hitler’s home, the Eagle’s Nest in the Bavarian Alps. His unit served alongside Easy Company of the 506th PIR – the group of soldiers made famous in a 1992 book by Stephen Ambrose, which was later adapted into the popular 10-part 2001 HBO miniseries, “Band of Brothers.” The man saw action. After the war, Chick returned to his hometown, and led a rather prosaic life, especially in contrast with his time in the Army. He managed a Shell Station, had a home insulation business, ran the club at an Elks Lodge (he was an active member of his Elks chapter) and ran a supper club until he retired. Kids, grandkids, the complete ‘catastrophe’ as Zorba put it. Chick would speak to local groups and schools about his experiences during the war. 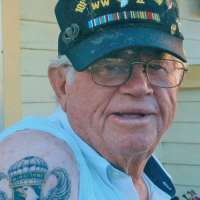 His Purple Heart and Bronze Star would, one would think, have been adequate tokens of his service, but in 2006, at the age of 83, he followed up on a plan he and his comrades had talked about before they went into combat. After, apparently, several pints in a London pub they agreed to get tattoos, only to be interrupted by an air raid. When they sobered up, they changed their mind. 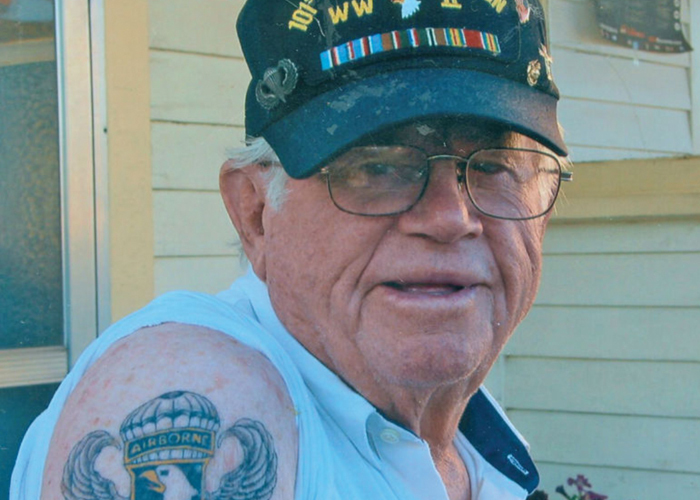 But some 64 years later, Chick got himself a tattoo, modeled after the airborne cap badge he wore as a paratrooper. Some people write letters, some write books. Charles ‘Chick’ Keim wrote history. I never knew Chick Keim when he was alive, but I bet I would have liked him. At least, I could listen to his stories and thoughts for hours if I had the chance. So why am I writing about him, now? Why did I dig into his history? 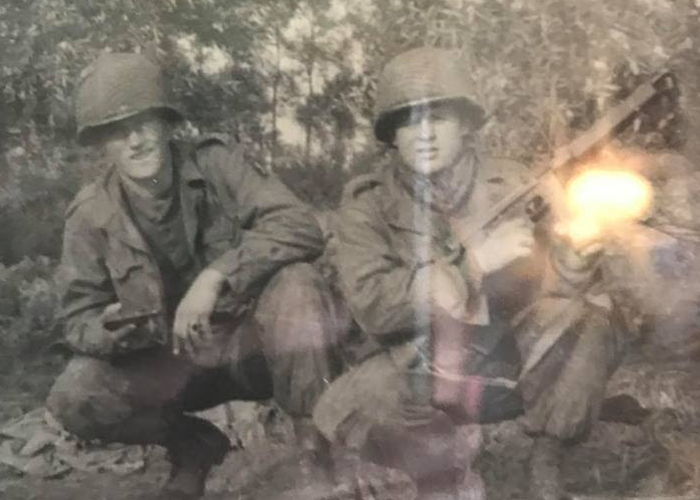 We connected, Chick and I, and my son Geoffrey, and my friend of 42 years Patrick Rafter, on a what we called our “Back to the Front” trip to visit battlefields where we had relatives fight during the first and second world wars. It seems fitting that we did this towards Memorial Day 2018. Normandy, the Somme, Bastogne were our main destinations, with a stopover to sample champagne, if you can call several bottles a sample, in Epernay, and a couple of days of wandering around Paris. We had amazing guides at all the battlegrounds we visited, including Sean Claxton in Normandy, Iain McHenry in the Somme region, and Henri Mignon, an 83-year old retired Belgian army officer. Their expertise and personal insights truly made history come alive as they took us to where the fighting had taken place, where American and British soldiers had fought in battles, large and small. I took my Garrett AT Pro metal detector and pinpointer with me along for our trip. I’m told that’s a nerdy hobby, and perhaps it is, but I find all sorts of things like bottle caps and pull tabs and rusty things that might have been something of interest. I also have collected a whopping $3 to date in coins! On our last day in Belgium, after we had said goodbye to Henri, we decided to try our hand at finding something with the metal detector. On that rainy morning, in a heavily wooded area between Bastogne and Foy, we discovered foxholes deep in the woods near vast farms where the 501st has dug in during the Battle of the Bulge. Oh we found rust, plenty of it, presumably from shrapnel, one live shell we carefully left for a disposal unit, and bits of buckles and bullet casings. Value? Zero in monetary terms, but emotionally they are a treasure. After a half-an-hour of looking, my detector gave a sharp “beep”, which means something other than iron. I told Geoffrey to dig ‘there’ and a few inches below the surface, we found a shiny dog tag, with the name “Charles H. Keim” on it, blood type ‘A’, religion ‘P’ of Ontario, Oregon. At first we pondered if we’d discovered an unmarked grave, but an Internet search on the spot took us to his obituary and a 2014 article in Chick’s hometown paper (The Argus Observer) and the details you’ve already read. I’m still shaking, wondering how he lost a single tag, and whether he was wearing this very one in the photos of him taken at the time. 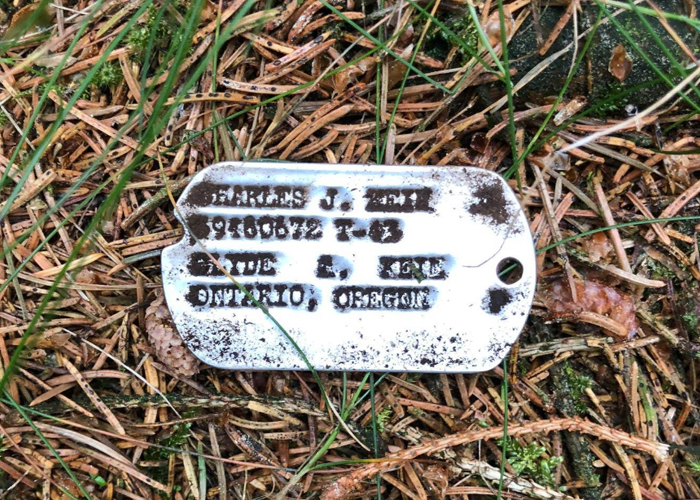 We’ve contacted his family and will return the dog tag forthwith, 74 years after it was somehow separated from Chick’s neck. The thrill Geoffrey, Patrick and I will always have of this discovery, this connection, is a reward that will last the rest of our lives! Which is why my son was able to say on the spot, “Dad! The detector just paid for itself.” Indeed it had, many times over. Postscript: I sent the tag to Chick’s son, Tom Keim. His son, Greg, told me his father is not usually an emotional person, but when he shed a few tears when he put Chick’s dogtag on his grave.